Frain Industries can help you with your fold wrapper or bunch wrapper project no matter how big or small your wrapping needs. Fold wrapper or bunch wrapper equipment and machines fold or bunch the loose ends of the film packaging around the product. Sapal BB, Automatic, 1 or 2 material, wrapper rated from 20 to 160 packages per minute for plain rectangular bar and 50 to 140 packages per minute for filled bars or bars with nuts – depending on materials and application. Package size range: 90mm (3.54") to 195mm (7.68") in Length; 30mm (1.18") to 95mm (3.74") in Width; 5mm (0.19") to 16mm (0.63") in Height. Sapal, DP-3, Dual lane, intermittent motion, horizontal wrapper rated from 100 to 400 ppm – speeds depending on materials, application and machine configuration. Product size range: 3/8" – 2" in Length; 3/8" – 1 3/4" in Width; up to 3/4" in Height. Equipped with two film unwind reels one per side, automatic film splicer, in feed conveyors and discharge conveyors with air reject and diverter gates. Features A/B PLC with dataliner, remote control panel, film registration, status light bars, photo eye, film presence, end of roll and paper rip sensors, safety guarding with electrical interlock. Rasch Model RK, automatic, intermittent motion, foil wrapping machine with number of wraps per minute – depending on materials, application and machine configuration. Capable of handling pralines or bars and round flat shaped bottom folds, pralines or bars end twist and end folds of most sizes and shapes, also egg shape. Equipped with 60" long x 3-1/2" wide product in feed conveyor, automatic product loader into 18" OD, 26 pocket product disc, 8" wide dual foil film unwind rolls with foil cut-off section, with form and fold section with 84" long x 2" wide product discharge conveyor. Control panel has A/B controller with start, stop, jog, centering and vari-speed controls with e-stop, status light bar and interlock safety guarding. Mounted on epoxy coated base frame. Change parts required to accommodate size range. 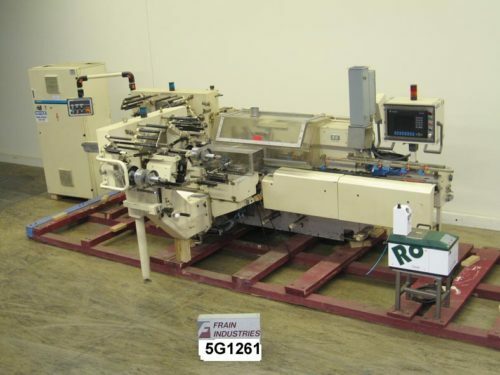 Rasch Model RU, semi – automatic, intermittent motion, bottom fold, foil wrapping machine with number of wraps per minute – depending on materials, application and machine configuration. Capable of handling pralines or bars and round flat shaped bottom folds, pralines or bars end twist and end folds of most sizes and shapes, also egg shape. Equipped with 21" OD, 16 pocket hand loaded product disc, 8" wide dual foil film unwind rolls with foil cut-off section, product pusher bar thru cut foil, 8 sets of rotary horizontal product grippers to intermittent motion bottom foil folding section and 70" long x 5" wide product discharge conveyor with top product tamp Control panel has A/B controller with start, stop, jog, centering and vari-speed controls with e-stop, status light bar and interlock safety guarding. Mounted on epoxy coated base frame. Change parts required to accommodate size range. Sig SC3/3, Automatic, horizontal, foil, and over wrap machine capable of speeds from 140 to 350 ppm, depending on application. Product size range of: 3.4" -7.04" L x 1" – 2.6" W x .05" – 3/4" H, has (5) sets of dual Eagle belt infeed timing conveyors, with a 36" L lugged chain product conveyor set on 4" centers with 4" W x 1/2" H lugs, (2) dual foil /over wrap film unwinds, and (2) dual foil / over wrap splice stations, with a max 14" OD x 6" ID film reels, registration, guilletine knife cut off for foil and over wrap, 45" L x 4" W product discharge conveyor, a Robatech Concept H/M glue system. Remote control panel, overhead swing arm controller, and a A/B 1000 panel view, status indicator light bar, low film indicator, registration, knife, film splice, servo motor drive, controls, with saftey guarding, and is mounted on base frame. Sapal BB, Automatic, 1 or 2 material, wrapper rated from 20 to 160 packages per minute for plain rectangular bar and 20 to140 packages per minute for filled bars or bars with nuts – depending on materials and application. Package size range: 90mm (3.54") to 195mm (7.68") in Length; 30mm (1.18") to 95mm (3.74") in Width; 5mm (0.19") to 16mm (0.63") in Height. Equipped with a 60" long Neoprene infeed conveyor with adjustable guide rails, shuttle transfer section, inner wrapping reel, outer wrapping stack, folding section, hot glue station, vertical transfer section, 2 chain lugged compression section, 24" long discharge section with side wiper brushes, Siemens controller with LED display, hot melt glue system, and interlocking Lexan safety guarding. Mounted on height adjustable legs with casters. Sapal SC-3-1, Automatic horizontal, foil, and over wrap wrapper rated from 120 to 300 ppm – depending on materials, application and machine configuration. Maximum product range: (7 1/2"L) x (4 3/4"W) x (1/2"H). 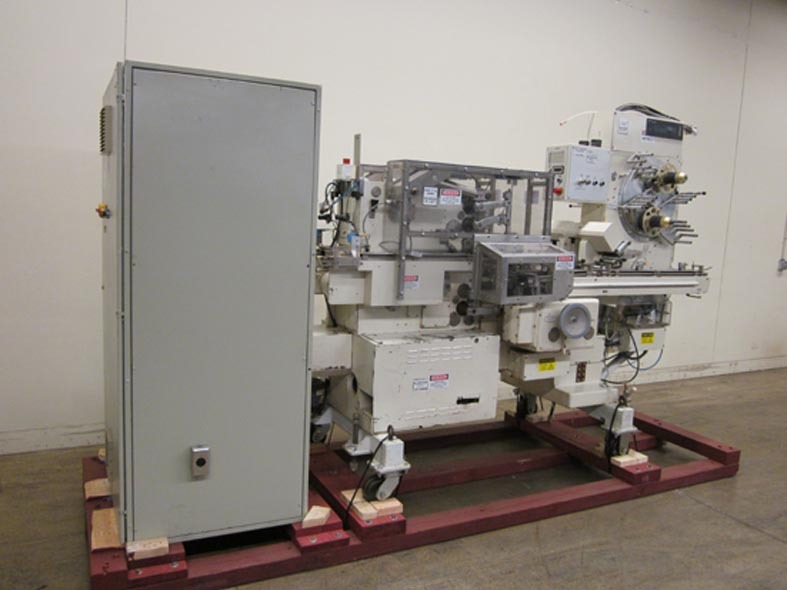 Equipped with hot melt glue system, (2) foil, and over wrap film unwinds, (2) foil, and over wrap splice station, registration, knife cutoff for foil and over wrap, six dual-rope in feed timing conveyors, lug chain product conveyor 4" centers with 1/2"H lugs. (45"L x 4 1/4"W) product discharge conveyor with air reject. Equipped with Allen Bradley Panel View, E-stop, status indicator light, low film indicator light, barrier guarding, overhead arm panel and servomotor drive. Mounted on height adjustable legs.